Thursday was a repeat of Wednesday, very windy and cold. Friday was less windy but, just as cold. The temperature didn’t reach 60 degrees on either day and we spent our time reading or getting ready for our move to Quartzsite on Monday. Mostly, we have been doing laundry and stocking up on food and water. Saturday and Sunday we have had lows in the 30’s, but the days have been mid-60s and sunny. The birds seem to like the warmer weather and have been out and about. 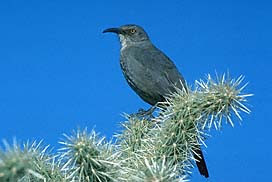 The only birds we added to the year list was a pair of Curve-billed Thrashers. Our current RV Park has been clearing out the past few days as more and more people head to Quartzsite. This next week we will be joining the wave of RVs heading that way to meet up with other members of Montana Owners.com. This will be our first time using the trailer without any hookups. We are planning to stay the week, but we will have to see how it goes. We don’t know if we will have any access to the Internet so I may not be able to post during this coming week.